We are thrilled to welcome Melissa Brown, owner ofYOGArithm in Kenosha, back to Yama Yoga to lead us in creating an original mala for yourself or as a unique gift for the upcoming holidays. 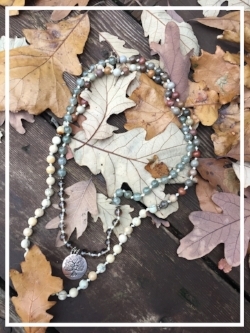 The mala is not only a meditation tool but a statement piece which can be worn as a single or double necklace or a wrap bracelet. A mala features 108 beads and is used to count mantra repetitions as you move from one bead to the next. Many are elaborately designed with a knot feature between each bead - the style we will be making. Please come with your creative mind and a little bit of patience, leave with a priceless art piece. You must register by November 8th to ensure your space! Please note that the duration of this event is only an estimate…some will be done in less time and others may take bit more time.